the wind is whistling by my window and it’s bleak & wet out there. Graham has cast and the plays are happily in rehearsal. I was at the audition and the readings were great. These two works are intriguing, can’t wait to hear how they end! I’ll list the cast in the next AdLib. This will be the first time that we are using the clubhouse as a mini theatre, with stage, lighting, sound and the bar an arm stretch away. Hope this will be the first of many exciting plays that we’ll stage at ‘home’. Good opportunity for new and innovative stuff from creative people to give their work a ‘try out’. THIS SUNDAY, 1ST SEPTEMBER, 12.30 P.M. WE ARE HAVING A CLEAN OUT OF OUR CONTAINER AND CLUBHOUSE. SOMETHING WE HAVE TO DO EVERY NOW AND THEN. YOUR HELP WOULD BE SO MUCH APPRECIATED IF YOU ARE WILLING TO HELP MOVE STUFF OR EVEN MAKE TEA FOR THOSE WHO ARE MOVING STUFF. NEXT SUNDAY, 8TH SEPTEMBER, 11 A.M.THIS IS WHEN WE’LL BE DOING THE SAME THING WITH THE LOFT – WHICH IS WHERE ALL THE COSTUMES AND PROPS ARE HOUSED. AGAIN WE CAN USE ALL THE HELP WE CAN GET.WE’LL BE GETTING RID OF MANY ITEMS, COME ALONG AND SEE IF THERE IS ANYTHING THAT MAY BE USEFUL TO YOU BEFORE WE TOSS THEM. With only ONE run through of all the items with lighting, sound and cues – and this immediately before the actual performance – the adrenalin was pumping as the audience crowded in. There were so many possibilities of things going horribly wrong. Oh me of little faith! With the honey-voiced Brian Winter charmingly holding it all together as M.C., a CAST cool as cucumbers and Glyn Fogell & Chris Laurie perfectly on cue with sound and lighting it all flowed smoothly. So much went into this concert in such a short time. There is no way to adequately thank everyone who participated and lent us their amazing talents for the night, or sponsored fabulous prizes, or worked their butts off to get everything set up and taken down in 12 hours, or calmly dealt with front of house, or kept things running smoothly backstage. Listing everyone would take up too much space….and I’m borrowing this space from the AdLib! Your place in Heaven is secure! The hero of it all was PINELANDS PLAYERS, who made everything available for our use including their entire committee! A Society with huge heart, spirit and generosity. The feedback from audience members was gratifying – thank you all for your support. Victor was overwhelmed. 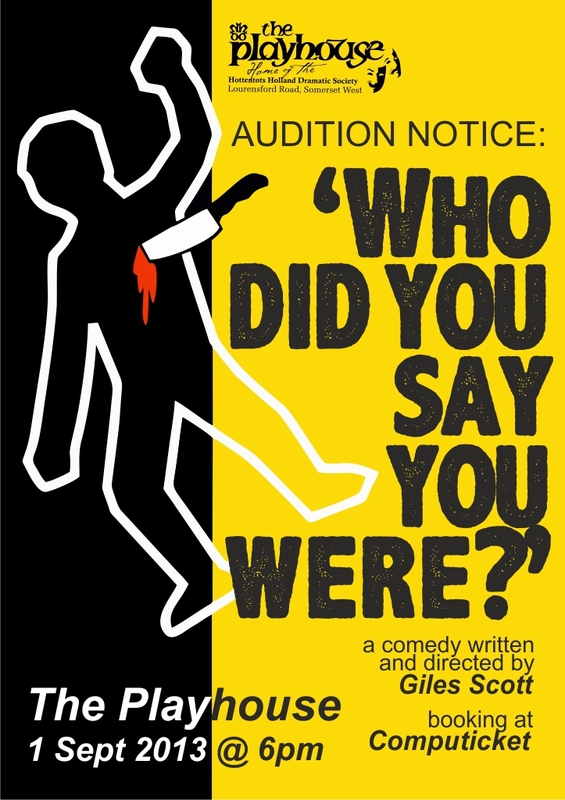 Hottentots Holland Dramatic Society is holding an Audition on 1 September 2013 at 19:00 at their Playhouse in Somerset West for Who Did You Say You Were?, a comedy written and to be directed by Giles Scott. More info? Contact 0723841953 or go to http://www.theplayhouse.org.za or http://www.facebook.com/PlayhouseSW. science); advisor, consultant, adjudicator, public speaker, can help with preparation for auditions, a third eye (i.e. if anyone wants me to come in and give advice for productions as an objective and experienced director),character help, copy writer for publicity, etc.etc. Lieske Bester: Soroptimist International means having friendship links all over the world. South African clubs receive support from overseas for many projects. S I Cape of Good Hope decided to assist S I Karachi Pakistan with their project: sponsoring school teachers who earn R100 per month ! On Sunday 3 November 2.30 p.m. Masque Theatre Main Road Muizenberg, we are hosting a gala production of Henceforward… with all profits to go to the project. Tickets cost R100.00 each and include a high tea. Please join us with the knowledge that each seat filled sponsors a month of education. Contact Lieske on liesak@mweb.co.za for more info. THEN AND NOW at the Milnerton Playhouse, presented by Bonny White 6th September. Bonny has offered yet another evening of musical entertainment that includes 12 to 14 of her past and present singing students. Bonny’s talented young people are always wonderfully entertaining and this evening will showcase singers from beginners to advanced, performing various items from musical theatre plus some jazz and contemporary numbers. Reon Jacobs will accompany them once again on keyboard. At only R5 for members and R10 for non-members, this is an absolute bargain for a full evening’s entertainment so don’t miss it. Doors open 7.15. A HANDFUL OF FRIENDS directed by Sue Bolton for Constantiaberg Theatre Players will be at the Masque from 20th – 28th September. A cleverly written study of 5 professional men and women, where self-seeking can hide beneath the most cultured surface and destroy those taken for granted values of friendship & trust. musical ‘Applause, Applause’ were both adapted from this award winning play. GUYS AND DOLLS directed by Kyla Thorburn for The Gilbert and Sullivan Society runs at the Artscape Theatre from 18th October until 10th November. This well loved musical needs no introduction! Booking through Computicket. THE COMMITTEE IS STILL DISCUSSING THE DETAILS OF REVIVING A PLAY FESTIVAL. WE DID CALL FOR FEEDBACK FROM SOCIETIES IN THE LAST ADLIB, BUT ONLY HAD RESPONSE FROM ONE. WE ARE AWARE OF THE ENORMOUS AMOUNT OF WORK THAT THIS WILL INVOLVE AND IT WAS A LITTLE DISAPPOINTING NOT TO HAVE MORE INTEREST SHOWN. TO START WITH, WE THOUGHT IT COULD BE A ONCE-OFF VENTURE FOR 2014, AND IF SUCCESSFUL COULD BE AN ANNUAL ‘HAPPENING’ ON THE THEATRE CALENDAR. I’LL KEEP YOU UPDATED REGARDING THIS. COMBINING THE IDEA OF THE TALENT SHOW & MEMBERSHIP DRIVE, THE COMMITTEE HAVE DECIDED ON AN IDEA WHICH THEY FEEL WILL BE AN EXCITING CHALLENGE AND MEMORABLE ‘HAPPENING’. A BROCHURE WILL BE SENT OUT, INVITING PEOPLE TO PARTICIPATE IN A ‘FLASHMOB’ PRODUCTION. THERE WILL BE AN ENTRY FORM AND EVERYONE WHO ENTERS WILL BE PART OF A PRODUCTION IN EARLY DECEMBER. THIS WILL BE REHEARSED AND PERFORMED IN ONE DAY. THERE WILL BE PRIZES AWARDED FOR BOTH PERFORMANCES AND BACKSTAGE. IF WE ARE OVERWHELMED BY TOO MANY ENTRIES, THERE WILL BE AUDITIONS. THE PRIMARY IDEA IS TO PROMOTE OURSELVES AND FIND NEW TALENT IN PINELANDS. WHY PINELANDS? BECAUSE OUR FIRST CONSTITUTIONAL AIM IS TO PROMOTE THEATRE HERE. HOWEVER THINGS HAVE CHANGED SINCE THE CONSTITUTION WAS DRAWN UP AND WE WILL NOT LIMIT THIS TO PINELANDS ONLY, BUT WILL HAPPILY INCLUDE ANYONE FROM ANYWHERE IN THE PENINSULA. THE BROCHURE WILL BE HAND-DROPPED IN PINELANDS AND WILL BE SENT OUT TO OUR MAILING LIST, APPEAR ON FACE BOOK AS WELL AS OUR WEBSITE. AN AUDIENCE WILL BE INVITED TO ATTEND THE PRODUCTION AT A VERY NOMINAL FEE. AS THIS GATHERS MOMENTUM, MORE PEOPLE ARE GETTING REALLY ENTHUSIASTIC ABOUT IT – INCLUDING YOUR COMMITTEE. there is an Amateur Dramatic Society in a city in Australia. My children went to see one of their musical productions and were gobsmacked. They said they couldn’t believe that the public (full house!) were exposed to such poor direction and performances even though a great deal of money had obviously been spent on elaborate costumes and sets in a fabulous theatre. And here we are, Pinelands Players – no theatre, a tiny clubhouse with very little space to house costumes and sets. What we wouldn’t do for the support cultural organisations get in Oz! But PP are not daunted by what we lack, we are enthused by what we can create! Audition – Who did you say you were? COME AUDITION THIS SUNDAY @ 6PM!!! A comic farce that builds on multiple layers of murder mystery written and directed by Giles Scott. It’s supposed to be a murder mystery weekend at a guest house, but one of the guests is psychic and has met the ghost of a real murder victim. The Celebrity The Colonel retired army officer 60+? Please note this is an amateur production. A month has disappeared before our eyes and we find ourselves in August! Let me repeat for dramatic effect …it is AUGUST! We find ourselves hurtling toward Christmas faster than a rocket full of monkeys. Those of us that witnessed the last members evening will be aware of the magic that is residing in CDS and how talented our new directors are and how spicy soup can be. As we are heading towards the end of year cycle and all the new and exciting projects that come with it, Henceforward I can promise you that we in for a good time…hold on, summer is coming I promise. Our members’ evening on 19 July was a real treat. Jenny Brandt and Liz Roodt provided a wonderfully diverse programme of quality theatre across a range of genres, with a combination of new and familiar faces. The performances were made extra special in that all three pieces were performed without scripts, in full costume and with props. Both directors were subjected to a Q&A afterwards, where they were quizzed on all sorts of aspects. We’re delighted to welcome two new directors on board – well done to both of you! Liz will be kicking off in the middle of next year with Agatha Christie’s ‘The Hollow’. Can you believe this is the first Agatha Christie that CDS has produced? Liz has arranged a neat line-up of productions by local playwrights, and it looks like we have a great evening ahead of us. There is one small snag though…Ralph Kelly is looking for a director and cast for his play ‘Drew’s Island’. There is a “psychopath”, aunt, two women (youngish) and another man in the cast. If you’d like to be part of bringing Ralph’s creation to life, please contact him as soon as possible: 021 686 0334 or rkelly@mweb.co.za. Thank you so much to those members who have dug deep into their pockets and contributed towards the replacement of the roof of our theatre. Lieske has contributed R4,500 from donations received in lieu of birthday presents – isn’t that a great idea? Unfortunately we are still a long way off, so if you could dig even deeper into your pockets, a multitude of thespians will be extremely grateful. If you can’t contribute directly, what about organising a fund-raiser of some kind? Every little bit of help goes a long way. Brenda Gray and her talented team have once again proved CDS’ ability to provide excellent, thought-provoking theatre which fully realises the author’s intentions. The plot revolves around a variety of relationships, largely within an artistic family- an aging actress, her daughter and her rising media star husband and the rest. Familiar ground to thespians. At the superficial level the play is simply an entertaining piece in no small measure akin to many of the “soapies” or telly-dramas to which one has become accustomed. Familiar relationship issues, witty dialogue, well-executed. Well done, have a drink, go home. To the discerning theatre-goer, however, the true genius of the play becomes clear as the relationships unravel in a complex series of situations, each horribly familiar and the more challenging for being so. It is possible for each audience member to identify, at least in part, with each character and each situation. The climax is thought-provoking, sad in its depiction of descent into banality of life and, to me, strangely unsatisfying. That, I think, was the author’s intent. The play does not set out to provide answers or resolution but to provoke thought and self-reflection even if that proves to be uncomfortable. It achieves this and the cast, under Brenda’s skilful direction, certainly provided a satisfactory exposition. The honours amongst the actors were evenly spread with every cast member turning in creditable performances. I particularly enjoyed the development Bernie brought to her role, but all played well. Sheila is to be congratulated for her fine stillness asleep in her wheelchair-very difficult to achieve without scene-stealing. The set was lovely-full marks to designer and set building and dressing teams. Music was well-chosen too. Special mention must be made of Constantiaberg Theatre Players who provided pretty well all of the technical and construction teams. Thank you so much for an efficiently performed set of tasks. So, a well-rounded production of a challenging play; challenges met; patrons entertained and caused, if so inclined, to think, without the need to resort to ostentation and pretentious artifice in order to achieve this. Another artistically excellent production of which CDS can be proud with considerable justification. Our year-end production has been cast. Drum roll please: James Skilton, Jo Frater, Kim Randleff-Rasmussen, Patrick Jordi, Grace Brain, Gavin Werner and Lucy Frater will be treading the boards and appearing on camera in Alan Ayckbourn’s futuristic black comedy, ‘Henceforward…’ Rehearsals started last week, and everyone is looking forward to getting their teeth into this challenge – technically and artistically. We are incredibly fortunate to have an equally talented crew on board too: Su Cunningham, Grant Bottcher, Gary Fargher, Bob Goode, Erika Marais and Jane Stone will be dealing with all the clangs, bangs and things that go bump in the night. Chemical concoction that can make smoke/steam. About the size of a cigarette box. …Take 3! Time to spring clean and spruce up our clubhouse – Sunday 22 September at 10am. Bring your tool box, muscles, sense of humour and something to put on the braai. Your committee will supply more tools, more humour (and probably a bit of silliness), a fire, salads and rolls for afterwards. We’ll be putting up shelves, tidying the props cupboard, sorting and chucking out excess costumes, and generally tweaking everything that needs it. Please let Simon know if you’ll be joining us (simon.d@mweb.co.za). Thank you to those who have paid their subs, you dedication and support is much appreciated. For those who still need to pay or want to join or re-join…. Milnerton Players next production will be the hilarious farce “It runs in the family” by Ray Cooney which will be performed during the first two weeks of November. Anyone with a taste for comedy would love being part of this fast moving romp. Auditions for the 12 characters will be held at Milnerton Playhouse Saturday 17 August @ 13.30 for 14.00 with the 2nd audition/call backs Saturday 24 August. Directed by Johann Van Der Merwe this is a farce in true Ray Cooney tradition with an abundance of misunderstandings, assumed identities and action in ‘fast forward’ mode. Think of the “Carry On” series and you get the picture. Hottentots Holland Dramatic Society is holding an audition on 1 September 2013 at 19:00 at the Playhouse in Somerset West for’ Who Did You Say You Were?’, a comedy written and to be directed by Giles Scott. More info? Contact 072 384 1953 or go to http://www.theplayhouse.org.za or http://www.facebook.com/PlayhouseSW. 28 Aug – 7 Sep – ‘Footloose’ presented by The Waterfront Theatre Company at the Masque. This Broadway classic follows the success of Hairspray in 2011. Directed by Paul Griffiths with Musical Direction by Garth Tavares, Design by Deon Bisschoff, Costumes by Delia Sainsbury and Choreography by Janine Binns and Ambre-Chanel Fulton, this toe tapping hit is not to be missed. “Book early – certain performances are already ‘Sold Out’! Tickets R100 (R80). Don’t forget GUYS and DOLLS is happening from 18 October till 10 November. Book at Computicket. I personally would like to bring a tortoise onto the stage, turn it into a racehorse, then into a hat, a song, a dragoon and a fountain of water. One can dare anything in the theatre and it is the place where one dares the least. With petrol going up YET AGAIN, I received some fun info concerning the price of other things from friend-of-MADS, Ed Cutten, which I thought I would share with you through this newsletter which may ease the pain of your next trip to the petrol station! Very sad news is that member Tom Byrne passed away on 29 July. He fought a long and courageous battle with cancer and enjoyed a year of remission. However, the myeloma became active again a few months ago after which he was in and out of hospital and had two courses of radiation therapy. There was hope of a good outcome and another period of remission but sadly he was attacked by septicaemia while his body was in a very weak state. No-one on the committee was aware of this at the time: we had no idea he was so ill. We take this opportunity of thanking Tobie Beele for aiding him in this difficult time as Tom’s family is in the USA. Tom will be remembered fondly by all of us at MADS who worked with him over the years. He contributed a great deal to MADS in many ways (acting in All You Need is Love, directing Eat Your Heart Out, set-building for productions-too-many-to-mention, etc) and will be a big loss to amateur dramatics. We were awaiting details of a memorial service to pass on to members but we have just heard that the cast of Eat Your Heart Out is organising a get-together in his memory. Unfortunately the venue they are using is too small to accommodate more than the cast. We will do a “remembrance” for him at our next members’ evening. On a happier note, June Edwards and Ginger Pig have been a-travelling and you can read all about their Scarborough adventure in the annexure to this newsletter!! Margi Blewett is recovering from a knee replacement op – take it easy there, Margi!! The next is on Wednesday, 18 September!! Diarise now – details to follow!!!! 22–24 Aug: Let’s Dance presented by Bronwyn Banfield’s Dance Studio at the Masque – enjoy an Aug evening of dance! Performances Thu. 22, Fri. 23 and Sat. 24 at 19:00. Tickets R65. 23 Aug: Marvellous Music – a tribute to and benefit for Victor Tichardt presented by Pinelands Players at the Pinelands Town Hall. Devised and staged by June Wells and Brian Winter. Many terrific artistes have volunteered their talents for this tribute! An all music programme, featuring songs such as ‘With a Song in My Heart’; ‘Mr Cellophane’; ‘Cabaret’; ‘Do You love Me?’; ‘Without a Song’; ‘Not While I’m Around’; ‘Get Happy’; ‘Stars’; ‘Cheek to Cheek’; ‘Send in the Clowns’. Tickets R130 which includes a cheese and wine welcome before the show, with various raffles and prizes. Doors open 19:45. Book on 021-5318683 or 072-4467532 or email cjwells@mweb.co.za. 28 Aug – 7 Sep: Footloose presented by The Waterfront Theatre Company at the Masque. This Broadway classic follows the success of Hairspray in 2011. Directed by Paul Griffiths with Musical Direction by Garth Tavares, Design by Deon Bisschoff, Costumes by Delia Sainsbury and Choreography by Janine Binns and Ambre-Chanel Fulton, this toe tapping hit is not to be missed. “Young Ren McCormack needs to dance… but in Bomont, a small Midwestern town, dancing is forbidden. In a place controlled by fear, can one man find the courage to inspire freedom? !” Extra performances on Weds at 20:00. Book early – certain performances are already ‘Sold Out’! Tickets R100 (R80). 12-21 Sep : A Streetcar Named Desire directed by Darryl Spijkers and presented by Carnivals of the Heart at the Playhouse in Somerset West. This award-winning American classic has a cast of 31 and includes 1950s New Orleans dance and song with creative direction from Verne Osmand and Renier Jacobs. Tickets R70 (Pensioners R50). Parental Guidance is advised – violence and drinking. Book through Computicket or email bronwyn@radis.co.za. Road to Mecca has just finished its run in the theatre – congratulations to director, cast and crew! Although we did not have full houses, comments from patrons were extremely positive and this was definitely a successful production. The MADS committee would like to extend very grateful thanks to members Ron Carr, Daniel Enticott, Nicky Enticott and Rosie McBain for assisting with the set-strike – the set basically came down in half an hour and this would have taken a LOT longer without their assistance. Thanks also, of course, to Tom Groves and committee members for their help. Alastair Duff, director, says “Thank you to all who attended, congratulations to all those who got a part and, to those who did not, the good news is that MADS has a line-up of fabulous shows next year! !” Watch this space! Congratulations to those celebrating a birthday in August!! We start with John McConnell on the 10th, with Phyllis Early the day after. Tobie Beele turns a year older on the 15th with both Sandy Gee and Ralph Lawson on the 20th. Joan Hitchcock’s birthday is the 25th with Lynwen Roman on the 29th and Michelle Knights on the 30th. Your birthday is the perfect time to wish you nothing less than favourite memories, plans and dreams that bring you happiness. For birthdays are a link between the future and the past, reminding us to treasure most those special joys that last! And now we have three members wanting to know if you can assist them!! I am a freelance theatre practitioner, proof reader (not thesis/textbook or dissertations/maths/science); advisor, consultant, adjudicator, public speaker, can help with preparation for auditions, a third eye (i.e. if anyone wants me to come in and give advice for productions as an objective and experienced director), character help, copy writer for publicity, etc.etc. Times are tough and at the moment I have no work at all!! I have a new job working for Fine & Country Estate Agents in Newlands in the Letting Dept!!. So ……if any of you know of anyone who wants to LET a property (house, townhouse, flat, hovel) or who wants to RENT accommodation pleeeeeeze bear me in mind and give me their details. I have to bring in my own business and work on a commission basis only, so every referral counts. My official area is from Rosebank to Wynberg, but I also get commission if I refer people to our other offices. Hope to hear from you! To let: Furnished single room & bathroom, kitchen, living room, garden to share. Overlooking False Bay, within walking distance to station & beach. Modest rent includes electric, water and internet access. Looking for suitable studious type house mate with references, proof of employment, student status or other, Please no con-men, nutcases or party-animals. See gumtree or contact David Osborn on 0794774371 or 021 7881147. Evian water costs R15.00 for 500ml = R30.00 per litre! So, the next time you’re at the petrol station, be glad your car doesn’t run on Water, Coke, or Vick’s Nasal Spray!!! Sir Alan Ayckbourn needs no introduction and many MADS members, Ginger Pig fans and his face book friends know what makes Ginger a very important pig, but to those who don’t, here’s what does. With no idea whether Sir Alan would be remotely interested in meeting just another fan with a battered, travel weary cardboard pig with celebrity status, or indeed be available at all, I emailed Sir Alan’s assistant, Simon Murgatroyd with a very tongue in cheek appeal to assist in setting up an appointment with Sir Alan. I shared the story of Ginger Pig’s rise to fame and invited Simon to visit Ginger Pig’s face book page. Voila! Within 24 hours came the following reply (truncated). Coleen and I were elated and my itinerary was fine tuned to accommodate a meeting with Sir Alan at six pm sharp on 14 June. At the end of my stay with friends near Liverpool, on the day of the appointment, I traveled from Liverpool to Scarborough by train, a relaxed journey of several hours across country, as the crow flies North East. Upon arrival I checked into my pre-booked guesthouse and with some hours to kill I did some exploration of Scarborough on foot, then it was back to the guesthouse to freshen up for the much-awaited meeting. All ready for Sir Alan, I set off on foot, the theatre being only minutes away from the guesthouse. The sky was threatening so Ginger Pig was duly wrapped in a plastic bag and my little camera tucked inside my hooded rain jacket. About halfway to the venue the heavens opened and Ginger was quickly tucked inside my coat. I felt a rather strange hard plop against my back but paid it no attention. Two minutes in the storm was enough to leave me rather windswept and bedraggled but no amount of wind and rain could dampen my enthusiasm and I soon ducked into the SJT foyer. I did after all say “come hell or high water”. I was early for the appointment and quickly made my way to the ladies’ room in an effort to improve my appearance. I was soon to find out why the two young ladies in the box office were amused as I went up the stairs. What I had felt on my back was the delivery of the biggest bird poop in history. It could only have come from one of the huge seagulls that were swooping and screeching in the storm. A small towel soon sorted out the wet hair and the hands drier did the rest. All ready for Sir Alan, I sat down on a couch in the foyer and fixed my gaze on the doors where Sir Alan would appear. I was as nervous as a six year old about to meet the Queen of England. Sir Alan and his wife Lady Heather soon arrived and she approached me with a wide smile while he went off in a different direction. She said: “You must be June Edwards, I’m Heather Ayckbourn”. I was initially rather overwhelmed but soon felt at ease when Lady Heather said: “Alan will join us in a minute, we’re going upstairs for drinks”. I had not known what to expect, a quick photo session and all would be over and done with or a little bit more than that, but to be invited to have a drink with them far exceeded my expectations. Once in the restaurant upstairs I was invited to sit down at a table that was obviously reserved for Sir Alan. Lady Heather gave the bar assistant an order for our drinks as Sir Alan came walking over to the table. He sat down opposite me and just looked at me while I was feverishly wondering whether I should speak to him first or wait for him to say something, we spoke at the same time. “I am honoured and very fortunate to meet you Sir Alan and thank you for making the time to see me” fell well-rehearsed out of my mouth and I still have no idea what he said while I was talking. Sir Alan was quiet for a few seconds and with an amused smile that reflected in his kind eyes he said: “So, June Edwards, you travelled far and long for a photograph. After that humorous and quirky appeal on email, how could I refuse you.” The ice was broken and conversation came easily after that and the photo session went well. Sir Alan wanted to know more about Coleen, the Masque Theatre in general and Ginger Pig’s travels and rise to fame. Coleen had written Sir Alan a letter, which I handed over, he opened and read it immediately saying: “I love fan mail”. Upon my request he wrote a message on Ginger Pig’s back and autographed the front as well. In order to make sure that I did not overstay my welcome with Sir Alan, I excused myself as soon as was polite after finishing my drink. Once I was outside on the street again the rain had stopped and the sun shone. If I could, I would have run and kicked my heels with delight at having accomplished my mission. A very happy admirer of Sir Alan Ayckbourn once again took to the streets to see what else Scarborough had to offer. What I will remember best, out of all that Sir Alan said during the few minutes I spent with him, is, “I am a much better writer than an actor. I do what I love, which is write and allow the directors and actors to run with my work” and “my title is just recognition for my work, I am just a man”. Ginger Pig will now take pride of place in Coleen’s home and I will make a fresh travel pig that can carry on with the globe trotting tradition. We are looking for a woman to play the role of an eccentric, ex-film actress, grandmother in a 12-minute dark comedy short film. We cannot offer any salary for the actress but we will pay for all travel expenses/offer transportation to and from set and cover all meals on set. You can reach me on productionofharold@gmail.com or on 081 315 2952. VOLUME 20, ISSUE 4 . Your Exco, together with a few of our Honorary Life Members, has been engaged over the better part of a year now in a process of evaluating where we are as a Society, and where we want to be in, say, 20 years time. The fact is that we are not the Society we were 20 years ago and we recognise that our existing structures may need some tweaking to keep up with the changes. Already some fruits of this endeavour are to be seen: the new website, workshops and concerts (see later in this newsletter), some longer term production planning, and possible organisational restructuring. Some of this may require amendments to our constitution, in which case a Special General Meeting will be called. In the meantime, we continue with Guys and Dolls. Cast news: Wesley Figaji is taking on the role of Nathan Detroit in the ‘Dolls’ cast, and Renco Griesel, aka ’Cheesecake Ike’h is joining the gangsters. Welcome to you both. Tickets: These are now available from Computicket and as Prefs from cast members. Prices are (Pref prices in brackets): Evenings: R250 (R225); R225 (R200); R175 (R160) Matinees: R240 (R215); R215 (R190); R165 (R160). And by now, we should be flying! Look out for our banner on the Artscape building as you drive past on the Foreshore. I was hoping to have a picture to prove it, but I haven’ft yet received it, and since this Newsletter is already overdue, I can’t wait any longer. So check it out for yourself. And how have rehearsals been going? Well, apart from benches threatening to break at crucial moments, and at least one instance of the showstopping number becoming a case of ‘Fall down, you’re rocking the boat’h . rather well, I thought. But here’s a more detailed insight from one of the cast members herself. Rehearsals for our upcoming production are well underway with plenty of exclamations of surprise being emitted recently at the news that we’ll be moving into the Artscape Theatre in just under EIGHT WEEKS! It seems like a fairly long time away still, but everyone on the team knows how quickly that will pass when everything that’s been accomplished over the last two months is pieced together into the very awesome whole. Garth Tavares spent a few weeks putting everyone through their vocal paces and painstakingly drilling harmonies into their heads. Once that process was completed, the focus was placed on the blocking, the dance steps, the production numbers… Which, of course, means that Garth will have to go over all those harmonies againc As most of us know, multi-tasking doesn’t always work so well during movement rehearsals! But while those harmonies may sound a little ‘interesting’ right now, Kyla, Mandy and Keenan are getting the company sitting, standing, touch-stepping, and skidding across the stage in 4 beats while trying not to crash into those skidding in the opposite direction. This sometimes involves a cast member falling off a bench and landing unceremoniously on the floor in a heap… No names shall be mentioned. At the same time William is yelling out ‘tendu’, ‘releve’, ’echappe’ at the Waterfront Theatre School dancers. Some of us find this confusing and think he’s ordering really special coffee, but we won’t admit it. Whatever it all means, the routines already have showstopping potential! Anyone who has chosen to pop into a rehearsal over the last many weeks hasn’t been offered the option of just relaxing and observing. A number of cast members have been involved in other productions so stand-in bodies are regularly required. No one is safe so be warned! We’re hoping to have the full cast at rehearsals from now on as all the individual scenes start being strung together and much memorizing and polishing takes place. Tickets are on sale already so make sure you book yours soon . you do NOT want to miss this production! techniques; basic rudiments of music literacy to enable easier reading and learning of G&S and Musical scores; and music and production rehearsals for ’Trial by Jury’. These sessions are sure to be great fun and very informative, and some of the sessions will be facilitated by guest experts in their specific fields. The idea is that we will present the piece in a semi-staged production for performances in various venues around the Western Cape from the end of this year and early next year. There are currently definite performances planned for 16th December 2013 and 23rd January 2014 with others to be announced shortly. Workshop and Rehearsal sessions will be held once a week on Monday evenings starting at 19h30 on 19th August. (That’s less than two weeks away!) Workshop/rehearsal venues will be announced shortly to those participating, along with a full schedule of all the sessions. The aim of this project is to give an opportunity to those not involved in the current major production of ‘Guys and Dolls’, to take part in an alternative production. Also, it is a great learning opportunity for those who will be auditioning for future productions . the workshop sessions generally will teach and hone skills required prior to going onto stage and on the stage itself. Over the past few years, the G&S Society has been running a series of concerts of G&S repertoire at old age homes and for other organisations and these concerts have always proved to be a popular, enjoyable and entertaining experience for all those taking part, as well as for the various audiences. This ’Project Trial by Jury Workshop’ will be similar in concept with the added dimension of being a ‘staged production’. All those who are interested in participating are requested to urgently contact Issy Silbowitz who has kindly agreed to facilitate the initial administration of this project. Please use his email address: justbooks@telkomsa.net to indicate your willingness to participate. Include your full name, your contact details (landline and cell phone numbers, and your email address), as well as your voice type (Soprano, Alto, Tenor, Baritone, Bass) if you know it. However, don’t worry if you don’t because we will help you to identify your true vocal range. Participants will be given the opportunity (their choice) to audition for various roles in the production during the course of the initial workshop sessions. And we can promise some surprises for those who know the show. Although it is our intention that the production will be sung traditionally, some characters may just evolve a little differently from the usual! We’re looking forward to hearing from many of you and promise a fun and rewarding experience. Jack passed away a few weeks ago. He built or part built numerous sets and props for us . and for various other amdram societies . over the years. He was one of those creative people who could create something from nothing, and take great delight in doing so. We honour his memory. He will be missed by the amdram community of Cape Town. Our loving greetings go to Karen. For those interested, it has been announced that after this year, the International Gilbert and Sullivan Festival will be moving from Buxton to Harrogate in the UK. For those of us who have taken our shows to Buxton in the past, that’s a little sad, as we’ve become quite fond of Buxton, but Harrogate also sounds good, and who knows, maybe we’ll get there some time in the future. Hottentots Holland Dramatic Society presents DANCE AFTER DARK at the Playhouse in Somerset West from Tuesday 6th to Saturday 17th August (there are matinees over the weekends). Tickets will be available at ticketnet.co.za or booking office: 072 097 5802. AUDITIONS: Pinelands Players are calling for auditions for two original plays written by Graham Leverton (now where have I heard that name before?!) and to be directed by him. Saturday 10th August from 10:00. ‘The Game of Cards’ is a drama involving a deadly game of poker. Required are 5 men (ages 20-45) & 1 woman (age 20-35). ’The Interview’ is a comedy about two bosses searching for the right candidate. Required are 4 men (20-30) & 1 woman (20-30). Performances 24-26 October.Contact Graham on 082 5509164. And that will do it for now. If you’re not in G&D, donft forget to contact Issy soon! My name is Mark and I am a student producer at the University of Cape Town. We are shooting our final thesis film in September from the 2nd to the 4th. Johan Visser: White. 50s. Clean shaven. Music Teacher. Middle Class. Christian. Struggling to maintain status in his family as patriarch. Feels emasculated by the death of his dog and the consequential fragmentation of his family. His growing paranoia and fear compensate for his lack of financial and emotional security. Johan is a quiet man whose insecurities prevent him from enjoying a fulfilling life. He is not proud of his achievements and squandered opportunities as a young man. His greatest joy is his daughter. His wife and him grow more distant every day. While his wife wants to move to Cape Town, Johan wants to remain in Stellenbosch. He takes a firm stance on this issue in an attempt to assert the little power he has left. Hanna Visser: White. 18. Matric Student. Beautiful and talented. A provincial swimmer. Nearing the end of her final school year. Though the apple of her father’s eye, she has a rebellious streak that is beginning to surface more and more. Andre Kruger: White. 50s. Bearded. Large man. Wine Farmer. Christian. Husband to Ilsa Kruger. Father of Eben Kruger. Owner of a wine farm and a very successful businessman. Conservative in his thinking, though cultured and well-read. The kind of man who talks nostalgically about the “old days” and refers to “the blacks.” Arrogant, callous, and cruel, he is nonetheless known for being very kind and cheerful. In a group he is often the centre of attention, able to talk at length about many aspects of life and thrill with his wild exaggerations. His racist attitudes make him unpredictable and intimidating while his ability to speak Xhosa and his moments of genuine gentleness make him human. Eben Kruger: White. 22. Good looking. Muscular Rugby Player. Student at Stellenbosch University. Christian. Son of Andre and Ilsa Kruger. An intense young man following in the footsteps of his father. His views are defined largely on what his influential father believes and says. He is thus similarly conservative in his views, though not as outspoken about them as his father is. His relationship with Hanna is still new and they show great affection for each other. Please email me on markbjhb@gmail.com if you are interested.